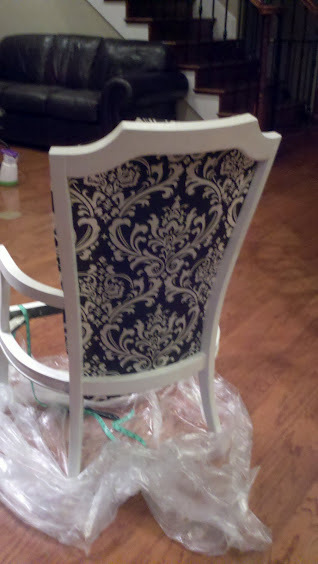 I salvaged these old worn out chairs from my Poppa’s house after seeing a beautiful chair on Pinterest, which unfortunately is no longer on their site. 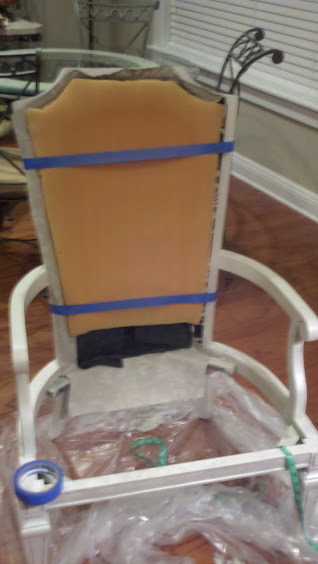 But I thought that I would have a go at up-cycling the chairs. I wasn’t planning on making a tutorial so there are a lot of missing pictures. I mainly took them so I could remember how to put the things back together. 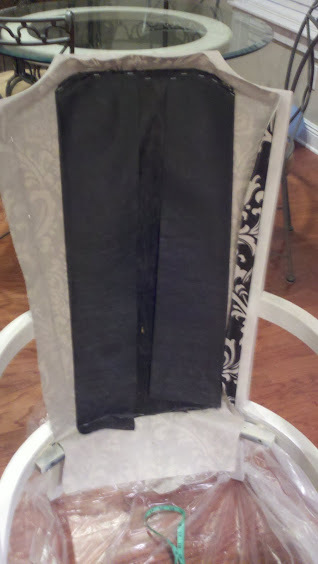 First, I had to remove all of the cording off of ALL the edges and removed all the staples so that I could carefully take the fabric off in order to use it as a pattern. This took about 6 hours per chair. Next, I removed that UGLY bamboo inlay. 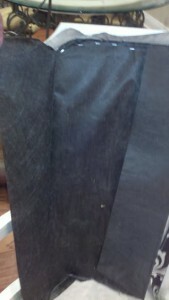 It was really easy to remove the center portion by cutting it with a pair of utility scissors. But around the sides the inlay was glued into a routed out groove and then toped by some sort of bamboo string to secure it in place. I ended up using a screwdriver to chisel it out. Then I used wood putty to fill any gaps. 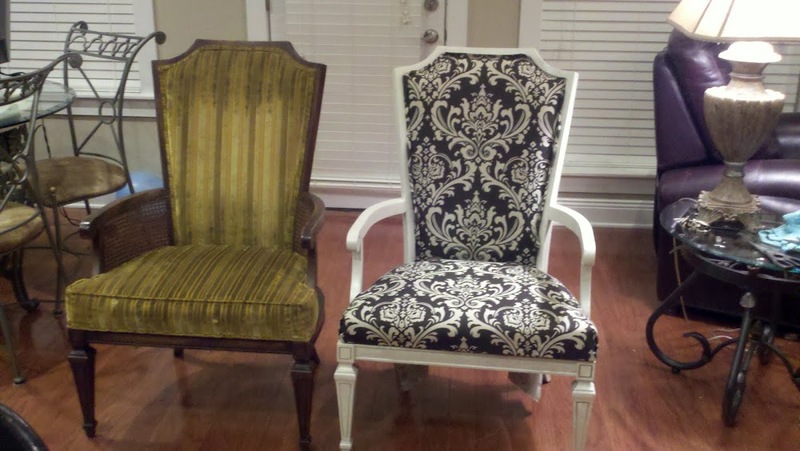 This is a picture that I later found at www.censationalgirl.com where she had the SAME CHAIR and reupholstered it. I guess we agreed that we could do better than the original ugly green corduroy fabric. I used a white spray primer and then stippled on several different shades of white, cream, pearl, and an iridescent glaze that I found at Lowes. Next was FABRIC TIME. I found some beautiful fabric by Priemier Prints for a great price. What I didn’t think about when I purchased it was the fact that I have a touch of OCD (except when it comes to doing the dishes) and would want things to be lined up and very symmetrical. I ended up needing a bit more fabric that I thought that I would, but still had plenty left over. I used the original fabric to line up the designs and then cut about a 2 inches outside of the fabric, to give my self a little extra room to line everything up so that it would be eye-appealing. I used a combination of painters tape and thumb tacks to hold it in place while I stapled. I think those little vice grips or clamps would have been better. But, I used what I had. 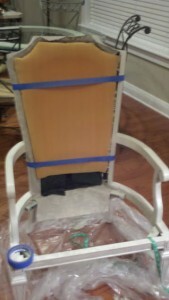 Next, I added the liner back to the chair to give it extra support. 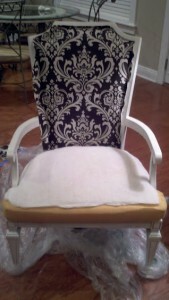 Next was the foam back support. It was in great condition! Otherwise, I would have added some extra batting. But, I didn’t have to. 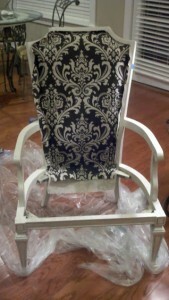 Notice the amazing use of the blue painter’s tape. It was safe to use on my newly painted frame but did it’s job to hold the foam where I needed it. Now, that this point I had to decide what to do with the seat. I wasn’t really fond of the boxed look of the original seat so I decided to deviate from the pattern and just make the front more rounded. I think the boxy-ness would have looked dated and sloppy. HOWEVER, If you are interested in the box look Censational Girl did an amazing job explaining her process. 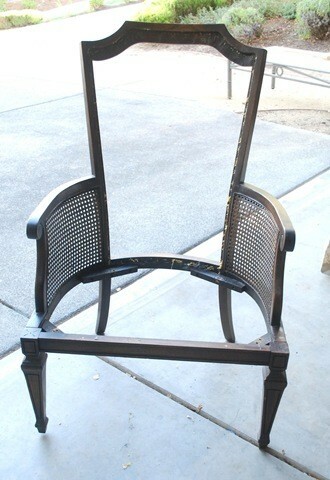 Here is a link: The King’s Chair. 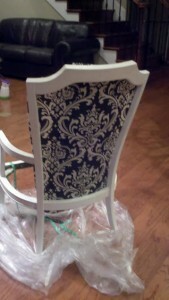 This is one chair untouched next to the other chair almost completed. 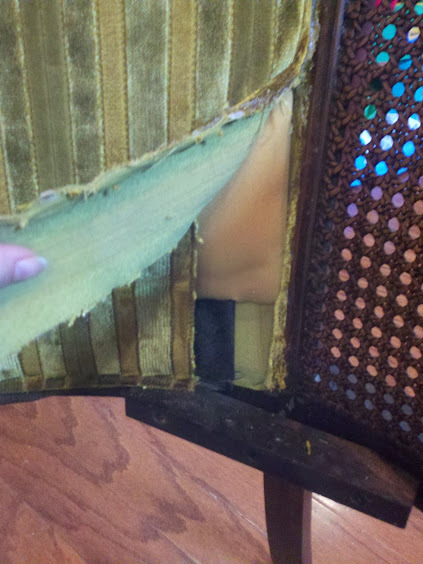 You can see that the fabric under the chair was still not stapled or secured. 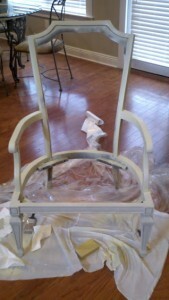 After this I decided to add the double welted cording around the frame of the chair and it finished it out. I made matching monogrammed pillows to complement the chairs. There is also a little foot-stool that I found in Poppa’s shed that I snagged and am in the process for completing it in the same fabric to complement the pieces. 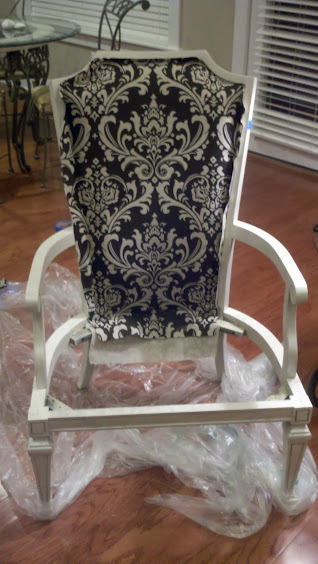 This entry was posted in Craftiness and tagged chair, Craft, damask, premier prints, reupholstery on July 19, 2012 by Lyndsey.